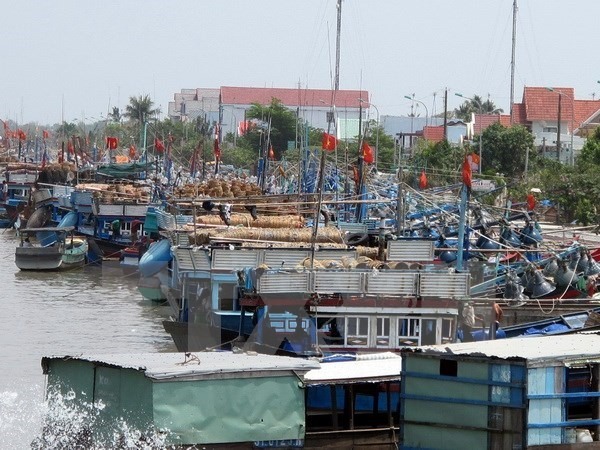 HÀ NỘI — Prime Minister Nguyễn Xuân Phúc has urged relevant ministries, agencies and localities to take drastic measures to cope with potential flooding from a tropical depression that is developing close to coastal areas. The tropical depression is moving towards the southern coast of the southernmost province of Cà Mau and is expected to directly affect coastal provinces from Bến Tre to Cà Mau and Kiên Giang, according to the National Hydro-meteorological Forecast Centre. The tropical depression is forecast to produce winds of up to 60km per hour and cause whirlwinds. Heavy rains of up to 200mm have already hit some south central provinces from yesterday. Central provinces from Thừa Thiên-Huế to Bình Thuận and the central Highlands region are expected to experience heavy rains. They are warned of possible floods, flash floods and landslides. Meanwhile, another tropical depression north of Palawan in the Philippines has winds of up to 60 km per hour near its centre. It is expected to continue moving westward, gaining strength and possible turning into a storm. Because of their movements, south-central and southern provinces are facing a double tropical depression, the National Steering Committee for Natural Disaster Prevention and Control announced yesterday at an urgent meeting. The PM asked the National Steering Committee for Natural Disaster Prevention and Control and relevant agencies to directly inspect, supervise, accelerate and co-ordinate with localities to effectively implement concrete measures to mitigate consequences. Localities in the areas affected by heavy rains and floods (from Thừa Thiên-Huế to Khánh Hòa and the central Highlands region) and areas forecasted to hit by the tropical depression should draw lessons from the historical floods in 1999 and 2016, keeping close watch over the development of rains, floods and the tropical depressions and proactively take preventive measures, the PM said. The preventive measures should focus on ensuring safety for ships operating offshore, such as informing and guiding ship owners on the development of the tropical depressions and banning vessels from operating offshore, depending on the real conditions of each locality; and examining and upgrading dyke systems and reservoirs, particularly those in high-risk areas. Local authorities are asked to proactively evacuate people in areas prone to floods and landslides and take measures to prevent flooding in urban areas, particularly in areas where the APEC meetings will be held. A delegation, led by Deputy Chief of the Secretariat of the National Steering Committee for Natural Disaster Prevention and Control, Nguyễn Đức Quang, worked with the People’s Committee of the Mekong Delta Province of Bạc Liêu on measures against the tropical depression. The delegation then directly examined preventive measures at high-risk areas in the province. On the same day, authorities of Trà Vinh, Sóc Trăng and Bến Tre went to high-risk areas to inspect and guide preventive measures and held urgent meeting to call on all available forces to be ready in terms of vehicles, materials and human resources to cope with possible floods and effects of the tropical depression.